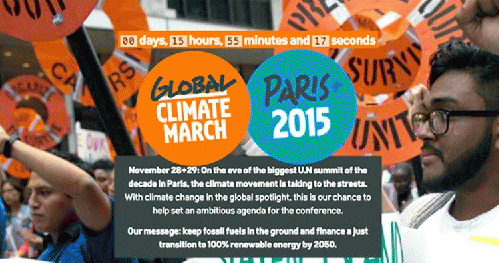 This weekend, before the opening of the climate summit in Pari s on Monday, hundreds of thousands of people are taking to the streets in more than 2,000 events spread across 150 countries to demand that negotiating parties keep fossil fuels in the ground and finance a just transition to 100 percent renewable energy by 2050. "While 2015 is on track to be the hottest year in recorded history, this weekend will be a further testament to the unprecedented surge in climate action we've seen in the last year and serves to pave the way for further escalation going into 2016. People everywhere are ready for the end of fossil fuels and the dawn of renewables," said Hoda Baraka, global communications manager for 350.org. Across The Philippines, more than 20 events, marches, and rallies are planned. In Manila, 20,000 people are expected to converge in Quezon City as part of a broad march with groups representing climate-impacted communities, faith organization, youth, labor, anti-coal and renewable energy. In Hong Kong, Taipei and Seoul hundreds are taking to the streets to demand a just transition to 100 percent renewable energy. In Vietnam a big climate music festival is planned, bringing together more than 1,500 youth. In Japan, the marches in Kyoto and Tokyo will feature a mass photo action where people will form one collective image. Across the U.S., marches will take place across the country -- from Los Angeles to Austin, to Washington, DC up to New York City, thousands will gather in creative, art-filled actions in the name of climate justice. Events are planned in Egypt's two largest cities (Cairo and Alexandria) where thousands will be running to raise awareness on climate impacts and call for urgent climate action. The divestment movement will be out in force worldwide, joining marches in London, Berlin, Amsterdam, Stockholm, Melbourne, Wellington and more! More than 5,000 cyclists will be taking over the center of Mexico City with marches also planned in Bogota, Colombia, Sao Paulo, Brazil and Bolivia. In Kampala, Uganda a huge march is planned to go through the city. Pope Francis is visiting Africa this week and in Kenya he will receive a letter asking the Vatican to divest emphasizing the moral call to divest from fossil fuels and make a just transition towards a world powered by 100 percent renewable energy. In Paris, where the government has prohibited the climate march from taking place due to security concerns in light of recent attacks in the city, people will join hands to form a human chain will now take place from Place de la Republique to Place de la Nation with participants carrying the placards, signs and artistic visuals initially developed for the march. "While we're restricted in Paris, we'll make sure that our governments hear our call for climate justice loud and clear from all corners of the world," added Baraka.